The response and quality of service from Rent a Villa in Tuscany and Fiona was outstanding. 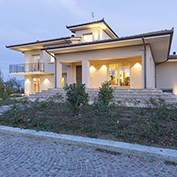 we decided at the very last minute to grab a week's break in tuscany and contacted Rent a Villa in Tuscany late one monday evening and had an immediate response with choices meeting our specification . Additionally we had a number of questions about the location and our preferences which were handled with professionalism and insight. Based on this we found ourselves on board our flight to Pisa early on Wednesday morning, confident we had made a good decision. The quality of the property high above Loro Ciuffenna was first class and exceeded our hopes, with the resident owner so welcoming , friendly and going way beyond the call of duty to help make our holiday memorable. The views were spectacular and the pizza at the very top of the mountain road was memorable. Thanks Fiona for making it all possible.